Today I’m featuring Dragon Knight’s Medallion by Mary Morgan. Full shock registered inside her brain as she realized where she’d seen this man. Her body started to quake, and she clutched her hands to her chest. Are all the fae so dumb and beautiful, he thought. “Ye ken who I am.” Stephen’s head caught a glimpse of the fae, as she started to take a few hesitant steps backwards. What the bloody hell was wrong with her? She was standing too close to the edge. If she was not careful, she would slip on over. Why did he care? She could just vanish, right? Stephen rubbed his face, the remnants of a headache still behind his eyes. Sweet Bridget! Now the fae was yelling at him. “Och, fae healer, stop your babbling,” he dismounted with a groan. “No, no, no!” Pointing a finger at him, she continued to walk backwards. Stumbling, her foot twisted among some tree roots, causing her to lose her balance. I am a constant daydreamer and have been told quite often to remove my head from the clouds. Yet, this is where I find the magic to write my stories. Not only do I love to weave a good tale, but I have a voracious appetite for reading. I worked for Borders Books for almost fourteen years. Imagine my delight to be surrounded by so many books, talking to others about them, and getting paid. I have traveled to England, Scotland, Ireland, and France. There are those who know me well when I say, “My heart is in the Highlands.” I believe I have left it there or maybe in Ireland. When not writing, I enjoy playing in my garden—another place where magic grows. Of course, there is time spent with my family. They are the ones that keep me grounded. Not on writing as much as I’d like, unfortunately. That much has probably become clear seeing as how this is my first post in months. To me it still feels like Halloween was only a couple of weeks ago. How’s your Christmas shopping going? Are you excited? Or are you one of the folk that just wants it over and done with? Me, I look forward to it. A day off, hanging out with family and eating some awesome turkey dinner sounds tremendous to me. Today is my guest is Hebby Roman and she is telling us about Latino Christmas Customs. I was born and raised on the Texas-Mexico border, and my husband of 25+ years is Puerto Rican. When I began writing romance, I wanted to bring my background to my books, so most of the characters in my books have been Latino. My first print published book, BETRAYED, was a historical romance set in my husband’s homeland of Puerto Rico. And my latest release from The Wild Rose Press, THE PRINCESS AND THE TEMPLAR, is a medieval romance featuring a Spanish Templar knight as the hero who falls in love with an Irish princess. From the beginning of my writing, I believed that casting Latino characters in my romances gives me a new and unique richness of culture and customs to draw upon. In turn, I hope my characters and their customs make my romances more interesting and vivid for readers. When I wrote BETRAYED, I learned that Spanish colonists in Puerto Rico imported some very different Christmas customs than those we see on Hallmark television. But there is a great deal of similarities, too, between the cultures. I learned to honor our shared customs while respecting our differences. Of course, a big part of the differences is that most Latinos’ religion is Catholic, so their religious observances and customs are definitely not Bing Crosby and a White Christmas. But culture, as well as the Church, has played a big role in Spanish Christmas customs. Las Navidades is the Latino holiday season, and it stretches from Nochebuena, Christmas Eve through Los Tres Magos, The Three Wisemen’s Day on January 6th, whereas our holiday tradition usually lasts only through New Year’s Day. But as I mentioned before, there are some customs that are similar to ours, like our Christmas caroling. Latino culture is enthusiastic about their music, and neighbors often serenade one another with Christmas songs or parrandas. But neighborhood serenading isn’t the only music reigning as king during the holidays. Every morning before dawn during Las Navidades at the local Catholic church, there are Misas de Aquinaldo or Christmas carol masses that culminate on Christmas Eve day with the Misa de Gallo or the Rooster Mass, so called because Latino traditional says a rooster crowed at midnight, heralding Jesus’ birth. In addition to music, the Latino culture features parades in the streets, balls given by the wealthy, and exhibitions of fine horses — not so different from today. But instead of giving to our favorite charity, Latino culture hosted aquinaldos, where a group of poor people carried a box through the streets with a brightly painted statue of one of the Catholic saints. The box was filled with flowers around the saint’s feet. And if the aquinaldo came to your front door, you were given the option of procuring the blessing of the saint by giving alms to the poor. Unlike our Christmas Day that features copious gift giving, Latinos exchange only token gifts on the Christ Child’s birthday. Their main day of gifting is on January 6th, Los Treys Magos, when the three Wise Men traditionally gifted the baby Jesus with frankincense, myrrh, and gold. There are a lot of similarities between our prevailing culture and Latino traditions: music and singing, attending church, and giving to the poor. But there are other differences, too, interesting differences. And those differences are what I believe gives my stories a unique and interesting perspective. I hope you’ll enjoy them, too. I can’t believe its December already. This year has just flown past. When my son was 5 years old he won a nutcracker. That Christmas in front of the whole family he asked if there were more. 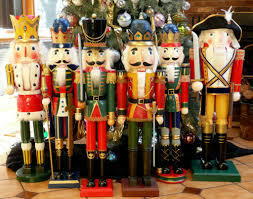 Now we have over 100 nutcrackers in various sizes from a few inches tall to three feet tall. Yes, that’s a lot of little faces looking at you. Over the years we’ve had fun with them. One day when I came downstairs they were marching down the hall. Another time they were all facing the wall because they were mad because I told the kids to go to bed. Then there was the Battle of Waterloo reenactment with cannons and green army men that occurred in the living room moments before dinner guests were expected. When my daughter asked if she could collect nutcrackers too, I knew my life would consist of a sea of little blank faces looking at me for the whole month of December. Friends and family have added to the collection over the years and now I’m sitting in my living room surrounded by brightly colored nutcrackers. For something different this year, the Professor decided to line the bigger ones up on the window sill, Now I have seven pairs of eyes peaking over the couch staring at me as if crocodiles waiting to lunge. Kind of creepy. Do I have a favorite one? No. Each one brings bring a great memory. Do you have any holiday collections that bring you great memories?